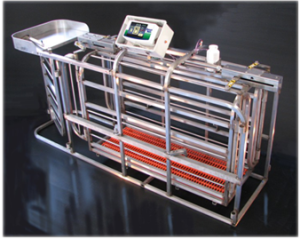 We design and manufacture the Automatic Pig Sorter for use on pig farms. These pig farm weighing and sorting scales are packed with high-tech features, making organizing and tracking weight data a simple task. The Automatic Pig Sorter was designed for maximum efficiency and minimum distraction or trauma to the animal. In addition, our brand ensures that the weighing unit provides the highest level of accuracy available. It is simply the best pig farm weighing scale system available in the United States or across the globe. The Automatic Pig Sorter alleviates the need to sort pigs by hand, saving you time and enabling you to create instant reports. In addition, the data collected by the pig sorting system is importable into Microsoft Excel or other programs. With Ethernet and wireless connectivity, you can communicate directly with your office system, or you can remotely access the sorter from another location. If you prefer, you can save weight data to a USB stick to be used on another system. The old-fashioned method of eyeballing each hog and estimating their weight is inaccurate and outdated. The Automatic Pig Sorter provides precision and accuracy when tracking the weight of your livestock. The sorting system also allows you to accurately budget for feed and space for your livestock, and with the Arlyn name, you can be sure of the best accuracy in the industry. The Automatic Pig Sorting System is constructed of a heavy gauge stainless steel frame with tubular bars. This design reduces stress on the hog during the weighing process. The control pad for the unit includes touchscreen functionality with an easy to use color menu. Perform two-way, three-way or even up to five-way sorting with the Automatic Pig Sorter. Monitor your herd’s weight gain over time and increase your accuracy and precision in designing diets and developing budgets for feed and health care. Quickly access and utilize weight data that is recorded by the system. Analyze the weight of your herd in the quickest possible time. Increase the productivity of any hog farm with the Arlyn Automatic Pig Sorter. With an automatic pig sorting system, you can assign hogs to up to five groups. Separate out hogs for health maintenance or treatment. Create a group for under-weight animals to be administered a higher-calorie, high nutrient diet and divert this group to a certain pen. Identify those animals whose weight is optimal for market and get them sold faster. There is no more need for visually sorting your herd. An automatic pig sorting system makes sorting and tracking your herd less time-consuming and more profitable. When you purchase an Arlyn Automatic Pig Sorter, you know that you are purchasing the best scale available on the market. Our scales are the most accurate and the most well made of any agricultural scale offered by any manufacturer. We use our proprietary ArlynLoad load cells made of top quality stainless steel. These load sensors have a 500% overload capability. The tubular frame construction minimizes injury and trauma to the animal while mounting and dismounting. The touch screen control panel is very intuitive and fully menu-driven. Automatically save data to integrate into reports and other applications. Save time, money and resources with the Arlyn Automatic Pig Sorter. SSI, or Smart Sort Innovation is a division of Arlyn Scales. This division researches and designs the most innovative methods for hog sorting. We integrate the high quality innovations developed by this team into our Automatic Pig Sorter system. We design and manufactures parts that go into building the Automatic Pig Sorter system. All load cells, sub-assemblies and components are built in-house for the pig sorter, as well as all of our products. All components are designed to seamlessly integrate and perfectly work together. We are committed to providing the best product for the most cost-effective price. Our professionals are available to take your call at 800-645-4301. Speak to a professional with any questions you may have about the Automatic Pig Sorter or of our products. Our professionals are available from 8 AM to 5 PM EST, Monday through Friday. Check out our extensive catalog of products online. The Arlyn Scales name ensures that you are getting the highest quality for the best price.